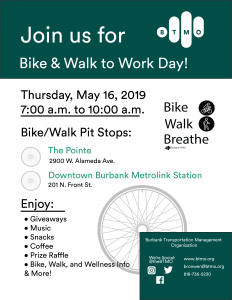 Join the BTMO and our community partners to celebrate Bike Month and Bike and Walk to Work day in Burbank! We will have music, snacks, giveaways, and Burbank organizations will be on hand to share information about how to get out of a daily commute spent driving alone. Burbank employees that bike or walk to work will even receive a commemorative T-shirt. Would your company be willing to be a vendor or donate to our in-kind raffle? Be a Vendor: To participate, your organization can host a vendor table at one of our Pit Stops and send representatives to give away information and swag. You’ll have the opportunity to connect with many employees from Burbank’s largest businesses! Be a Prize Donor: You can also donate a prize to be included in our raffle. Prize donors are thanked in event advertising materials and highlighted on the day of the event! Please let us know if your organization would be willing to be a vendor at one of our pit stops or be a prize donor for our event-wide raffle ASAP. All participating organizations will be featured in our event related communications, which are distributed to over 50 of Burbank’s largest employers.